I have a beautiful Persian lime tree in my back yard, and a good friend has a super productive Meyer lemon. Two months ago my lime tree was covered with fruit, and my friend brought over a grocery bag filled with lemons. So, instead of lemonade, I made salt-preserved lemons and limes. This is an old tradition in parts of the middle east. The citrus gets soft and mellow after a month or so in the fridge. The resulting preserved citrus has a bright delicious citrus flavor and the natural pectin in the rind adds unctuousness to recipes. Cut the fruit almost all the way into quarters, leaving one end intact. You can quarter the fruit if you like — it’s up to you. Put a couple tablespoons of salt in the the bottom of a clean, sterilized, glass quart jar. Next, rub salt all over the citrus and put the salt covered citrus in the jar. Don’t be shy with the salt! Really coat the citrus in salt. Repeat with more fruit, and pack them in. The juice of the citrus will squish out — this is what you want. You will end up with the lemon or lime juice totally covering the fruit and a layer of undissolved salt in the bottom of the jar. Add more freshly squeezed juice to cover the fruit, if needed, to minimize the air layer at the top. The salt will dissolve over the next couple of days. My photo above is taken right after I made the preserved citrus, so you can see the salt at the bottom. It’s OK if you still have some undissolved salt after a while. Put the lids on the jars and place at room temp for two days, giving the jars a turn or shake a couple times to help redistribute the salt. Don’t open the jars during this rest time. Put the jars, unopened, in the fridge for at least three weeks. Then — enjoy! They will last in the fridge for around 6 months. Here’s a link to a chicken dish in which to use preserved lemon. 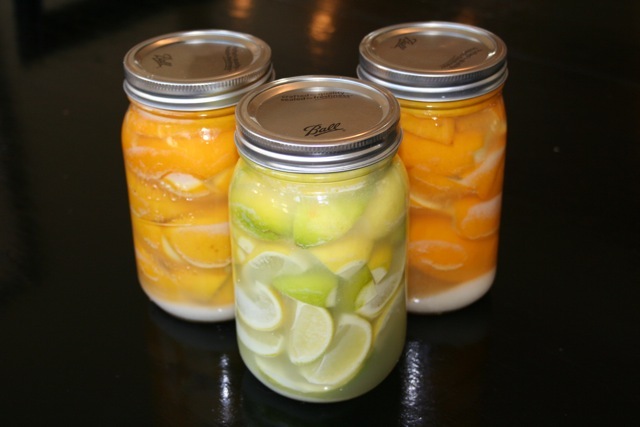 When you use the preserved citrus, rinse them and discard the pulp if you want. I’ll post a recipe I created to use my preserved lime soon. SO yummy. Frank makes preserved lemons and when he makes curry, we chop up the lemons with some Indian pickling spices for a really fabulous chutney. Yum. Yum — I’m just beginning to use it. I liked my limes even better than the lemon. If you send the recipe I can post it, with all due credit to Frank.